Real Escape Game"Escape from the Despair Toilet"
You are a 5th grade student at an elementary school. On one faithful day during class, you experience a sharp pain in your stomach. "T-Teacher... May I go to the restroom?" Through the embarrassment, I mustered the courage to say. All eyes turned to me, and it felt like the entire class was laughing at me through their eyes. I might be overthinking, but it's better than leaking in the classroom! It was that moment when another hand shot into the air. "Teacher, may I go too?" It was the plain kid at the window seat. The kid who is barely noticed in class... Or that might actually be me. Was he having a stomach ache too? "At this time?! Fine, go quickly both of you. And make sure you're back before the school bell goes off!" I stood up and walked out of the classroom as calmly as I could. "Let's hurry. The class will make fun of us if we're not back before the school bell!" "W-Which toilet is the closest?" "The one at the back of the staff room! We can sneak in at this time." "But isn't that one off limits?" Neither of us knew that this would lead us to the start of an unfortunate event. That those toilets had such an outrageous trick to them.....! Have a quick go at it! the game a second time! Buy tickets for your preferred day and time. Or get tickets on the day from the ticket counter on the 1st Floor. Listen to the rules and instructions careful, and start the game! Work in pairs to clear the game and escape! 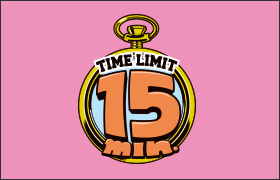 Time limit of 15 minutes. 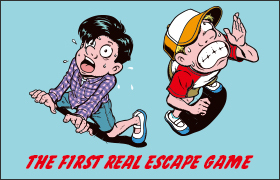 Unlike other Real Escape Games, you can challenge the game a second time! I have a bad memory of leaking myself when I was in elementary school. I was made to wear the school’s backup trousers, and cried myself all the way home. I wouldn’t have had to endure such an embarrassing incident! But… what if something worse happened, like getting stuck in the school toilet?! That’s true despair right there!! That’s where the idea of “Escape from the Despair Toilet” came about. What kind of puzzles can be found in the toilet? How can one escape from there? What is a 2-player only system? I put in my all and worked hand-in-hand with SCRAP to create a piece that I can be proud of. I believe that this is the best 15-minute game there is! I believe this game can achieve that at the highest level. your lover, or your best buddy!! Must be played in pairs. A total of 9 pairs can play this game at the same time, but the game must be challenged in groups of twos. The time limit is 15 minutes. There will be no debrief after the game, so you can challenge the game again if you do not clear it. Get tickets for the day and time you want to play, and come to the venue 10 minutes before the starting time. Also, this game cannot be played alone, so be sure to come with someone else. *This game cannot be played alone. Make sure to come with someone else. *There will be no debrief or explanation after the game. 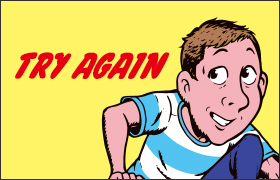 For players who do not clear the game and want to try again, be sure to receive a "Try Again Card" before you leave. Also, be sure to bring that card again the next time you come to play again. *If it is not your first time to play this title, please purchase the "Try Again" Pair Tickets. You will also need to show the "Try Again Card" that you received during your first play. Please remember to bring the Try Again Card when you come to play again. *If it is your first time playing, but you come with someone who has played once before and has a "Try Again Card", you are both eligible to purchase the "Try Again Pair Tickets" at a lower price. *For players who have played the game once before, we recommend coming with someone else who has also played the game once before, instead of someone who is playing for the first time. This is to ensure both players enjoy the game equally. A real-life interactive game where players are locked up in a room, and must decipher the riddles, signs, and secrets around them to escape before time is up! The venue can be anywhere: An apartment room, the amusement park at night, a baseball stadium etc. Real Escape Game has attracted over 3.6 million players since 2007. Not limited to Japan, Real Escape Game has expanded to other countries and has attracted fans of all nationalities and ages. It's a large-scale entertainment that's garnering attention world-wide! Due to the nature of the game, you may not be allowed to join if you are late. This Real Escape Game title must be challenged in teams of twos. Due to the nature of the game, some parts include acting by the staff based on the storyline. Please keep that in mind and enjoy the acting. Also, do note that it is based on schools in Japan. If anything seems unusual to you, please imagine that this is how schools are in Japan! Please understand that each player will be placed in a narrow room for this game. 1 Pair Ticket will allow 2 players to participate in the game. For first-time players of this game title, please purchase 1 Pair Ticket. What are "Try Again Pair Tickets"? One Try Again Pair Ticket will allow 2 players to participate in the game. However, these tickets can only be used by players who have already tried this game title once before. You will also need to show the "Try Again Card" that you received during your first play. Please remember to bring the "Try Again Card" when you come to play again. Are there any other tickets beside Pair Tickets? This game must be played in pairs / two players, and cannot be accomplished alone. During the game, each player is placed in separate rooms side-by-side, and must cooperate to clear the game. Therefore, it is impossible to play the game alone. We seek your understanding that only "Pair Tickets" are available. What do you mean by "For pairs only"? This Real Escape Game title is special in that it can only be played with 2 players - No more, no less. Each player is placed in separate rooms side-by-side, and must cooperate to clear the game. Bring a friend along to try it together! Can I try the game multiple times? This game has no debrief or game explanation after the game finishes. For players who do not clear the game and want to try again, be sure to receive a "Try Again Card" after the game. You must bring the "Try Again Card" when you come to play again the second time. If it is your first time playing, but you come with someone who has played once before and has a "Try Again Card", you are both eligible to purchase the "Try Again Pair Tickets" at a lower price. However, for players who have played the game once before, we recommend coming with someone else who has also played the game before, instead of someone who is playing for the first time. This is to ensure both players enjoy the game equally. The time for entering and registering is 10 minutes prior your game session. *Due to the nature of the game, you may not be allowed to join if you are late. How long does it take in total? Although the actual game play is 15 minutes, please set aside 30 minutes including instructions and explanation by the staff. Due to the nature of the game and also because the room is very narrow even for a physically abled person, we apologise that a wheelchair-bound person cannot participate. Children of elementary school age and above will require a ticket. The game's level of difficulty can be enjoyed even by an elementary school child. However, to enjoy the game at its fullest, we recommend that the other player is an adult or guardian of the child. Is there somewhere to leave our bags/luggages? Small hand carry bags can be brought into the game room with you. For larger-sized bags and suitcases, you can leave them with the Ticket Counter on the 1st Floor with a fee of 500 yen. However, please note there is limited space available. If there is no space, we ask that you place your large belongings in a public locker. Can I upload spoilers onto my blog or social media? Spoilers are prohibited for this game. Do not upload answers or photos of the puzzles to your blog, Facebook, Instagram, Twitter, or any other digital platform. Please also be careful when you discuss the answers to the game after it has ended. There will be many players in the same floor or facility who have not tried the game yet. How do I make sure that my friends and I play in the same team? This game is played in a group size of 2 people. Therefore, if your group of friends is an odd number like 3 or 5, one person will not be able to participate. Please make sure to come in even numbers. ・Children of elementary school age and below must be accompanied by an adult of guardian. ・Children of elementary school age and above will require a ticket. Supported by: Yoshimoto Creative Agency Co., Ltd.
Real Escape Game is a registered trademark of SCRAP Corp.